A bleed is an area the extends beyond the edge of your design that allows for your design to print to the very edge of the card without gaps. 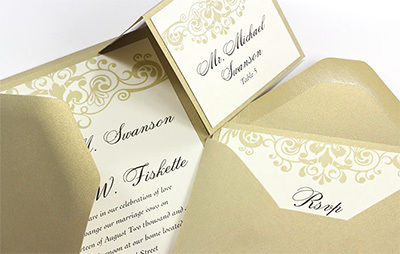 Right, an invitation, reply, and place card with bleeds (filigree to the very edge). Do I Need a Bleed? If your design goes to the very edge of the card, you need to select yes, bleed. If your design leaves a border, you do not. Why Do I Need a Bleed? 1 – The first is the simple fact that most printers are unable to print to the very edge of paper. 2 – Second, bleeds are added to eliminate unprinted gaps and borders along the edges of cards. Even if printers could print to the very edge of paper, during the printing process, it is common for prints to shift fractions of an inch. This means that the positioning of any card can differ slightly from the next. When your final printed stack is brought to the cutter and sliced in one fell swoop, this lack of uniformity causes some cards to have blank space along the edges – not a good look. 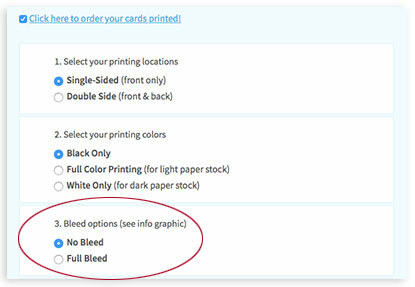 Why Does it Cost More to Print Cards with Bleeds? Bleeds cost more because the extended area of the design means it has to be printed on oversized paper, then cut to size. 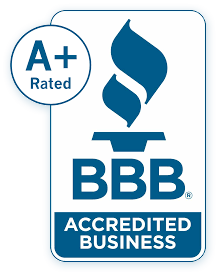 Our bleed fee accounts for additional paper and cutting and is based on quantity. How Much of Bleed do I Need in My File? We ask that you please include a 1/8 inch bleed on all sides. 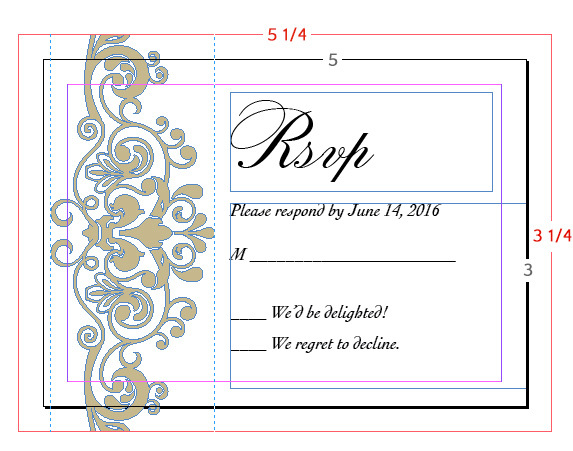 For example, if you need a finished card size of 3 x 5, please submit a file that is 3 1/4 x 5 1/4. Right, an example of inDesign file with a 1/8 inch bleed, resulting in an additional 1/4 inch in width and height.